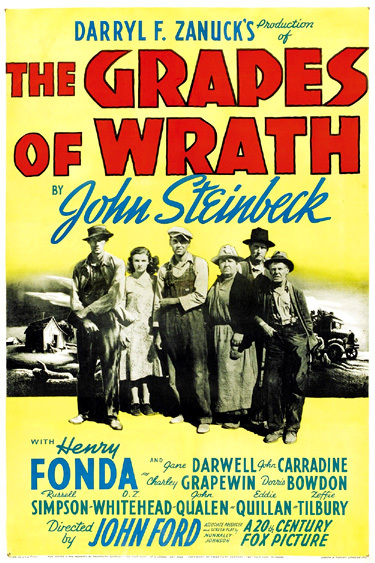 The Grapes of Wrath (1940) is director John Ford's most famous black and white epic drama - the classic adaptation of John Steinbeck's 1940 Pulitzer Prize-winning, widely-read 1939 novel. [Note: The sentimental film is much more closely related to Ford's social protest dramas, The Informer (1935) and How Green Was My Valley (1941) than to his magisterial Westerns.] This film was the most popular left-leaning, socialistic-themed film of pre-World War II Hollywood. The title of the film was taken from the Battle Hymn of the Republic, by Julia Ward Howe ("Mine eyes have seen the glory of the coming of the Lord, He is trampling out the vintage where the grapes of wrath are stored, He has loosed the fateful lightning of His terrible swift sword, His truth is marching on"). On the screen, the film honestly and realistically recreates the socio-economic impact of the Great Depression and a mid-30s drought upon one representative family - the Joads. Its theme of an oppressed people's epic move to a new home parallels the Biblical story of Exodus. Their family name, Joad, also evokes the Biblical character of Job. Nunnally Johnson's screenplay is remarkably faithful to its Steinbeck source material. Not present in the novel or the screenplay is a tacked-on ending in the film that optimistically and sentimentally affirms the strength and human dignity of the individual spirit. Numerous other times, Hollywood has capitalized on other Steinbeck works and adapted them for the screen: Of Mice and Men (1939), Tortilla Flat (1942), The Moon is Down (1943), The Pearl (1948), The Red Pony (1949), East of Eden (1955), and Cannery Row (1982). There were a total of seven Academy Award nominations for the film - with two wins: Best Supporting Actress (Jane Darwell) for her role as the archetypal mother figure, and Best Director (John Ford). The other five nominations were Best Picture (that lost to Hitchcock's Rebecca), Best Actor (Henry Fonda in one of his greatest film roles), Best Screenplay (Nunnally Johnson), Best Sound Recording, and Best Film Editing. In the same year, when ten Best Pictures were nominated, director Ford had another entry: The Long Voyage Home (1940). A year earlier, Lewis Milestone directed another adaptation of a classic John Steinbeck novel, the tragedy Of Mice and Men (1939), with five Oscar nominations and no wins. The plight of the Joad family is universalized as a microcosm of the thousands of other tenant farmers during the country's time of crisis, who suffered from oppression imposed by the banks and big mechanized farm interests. The dispossessed, migrant family's departure from their windy and dusty land, and their slow disintegration provides insight into the thousands of Oklahoma, Colorado, Texas Panhandle, and W. Kansas families who were evicted and uprooted from their "Dust Bowl" farm land, and forced to search westward in the inhospitable Eden of California for jobs and survival with thousands of other migrant workers. Jane Darwell is marvelous (although her accent is inappropriate) as the strong center and backbone of the migratory family that must leave its ancestral land, and Henry Fonda is magnificent as an unmercifully-harrassed Okie who refuses to be beaten and crushed by misfortune. The film's themes include the central importance of the family, the suffering and oppression of the farmers, the hollowness of the American Dream, the display of human dignity and spirit in the face of adversity, and issues of social and economic justice. Original casting for the film called for Beulah Bondi as Ma Joad, James Stewart as Al, and Walter Brennan as Pa Joad. Filmed in journalistic, documentary-style black and white textures with some low-key lighting and chiaroscuro (often provided by a candle or low light source) - beautifully captured by Gregg Toland's expert cinematography (remarkably un-nominated! ), the picture records with astute realism rural America in the 30s. [One year earlier, Toland had been cinematographer for Wuthering Heights (1939), and a year later, he completed the cinematography on Citizen Kane (1941), often regarded as the best film ever made.] Toland's visual images in this film resemble the migrant worker photographs taken by still photographer Dorothea Lange during the Depression. And the musical score by Alfred Newman used variations of "Red River Valley" to give the film added flavor. It is truly ironic that Peter Fonda, the son of the film's main star, paralleled his father's role in The Grapes of Wrath in his own starring role in Easy Rider (1969) as Wyatt - another independent, heroic, wandering nomad across the Southwest US in a frustrated pursuit of dreams and a better, more idyllic life. However, in pursuit of the 'American dream,' similar to the Joad family's quest, he travels from California (the supposed land of opportunity) to New Orleans - in the opposite direction. In the central part of the United States of America lies a limited area called 'The Dust Bowl,' because of its lack of rain. Here drought and poverty combined to deprive many farmers of their land. This is the story of one farmer's family, driven from their fields by natural disasters and economic changes beyond anyone's control and their great journey in search of peace, security, and another home. Figure: How about a lift, Mister? Figure: Sure, I see it. But a good guy don't pay no attention to what some heel makes him stick on his truck. Driver: Well, scrunch down on the running board 'til we get around the bend. You know what I'm talkin' about. You've been goin' over me ever since I got in. Why don't you ask me where I've been?...That big nose of yours been goin' over me like a sheep in a vegetable patch. Well, I ain't keepin' it a secret. I been in the penitentiary. I been there four years. Anything else you wanna know?...I'm just tryin' to get along without shovin' anybody, that's all. You're about to bust a gut to know what I done, ain't ya? Well, I ain't a guy to let ya down. Homicide! Tom: Ain't you the preacher? Casy: Used to be. Not no more. I lost the call. But boy, I sure used to have it. Oh, I used to get an irrigation ditch so squirmin' full of repentant sinners I pretty near drowned half of 'em. Not no more. I lost the spirit. I got nothin' to preach about no more, that's all. I ain't so sure of things. I asked myself, what is this here call(ed) Holy Spirit? Maybe that's love. Why, I love everybody so much, I'm fit to bust sometimes. So - maybe there ain't no sin, and there ain't no virtue. There's just what people does. Some things folks do is nice, and some ain't so nice. And that's all any man's got a right to say. 'Course I'll say a grace if somebody sets out the food, but ma heart ain't in it. I've been in the penitentiary for four years...I'd do what I'd done again. Killed a guy in a dance hall. We was drunk - he got a knife in me and I laid him out with a shovel. Knocked his head plum to squash...He had a knife in me, that's why they only give me seven years. I got out in four - paroled. Last time I seen him was at a baptizin'. He had one of the biggest doses of the Holy Spirit I ever seen. Got to jumpin' over bushes, howlin' like a dog-wolf at moon-time. Finally, he picks hisself out a bush big as a pianah, and he lets out a squawk and takes a run at that bush. In the dark, deserted, abandoned, wind-blown Joad cabin [clearly a studio set], Tom cries out: "Ma!? Pa!? Ma!? Nobody here. Somethin's happened...They're all gone or dead." Thinking that his folks are dead because no one is there in the semi-haunted farmhouse, Tom fears the worst. From the shadows emerges a crazy, "touched," dispossessed tenant farmer, a former neighbor named Muley Graves (John Qualen) who became deranged after surrendering his land. Tom: What happened? How come they got to get off? We lived here fifty years, same place. Muley: Everybody's got to get off. Everybody's leavin', goin' out to California. Your folks, my folks, everybody's folks. Everybody except me. I ain't gettin' off. Muley: Listen. (Muley gestures toward the howling wind.) That's some of what done it. The dusters. They start it anyways. Blowin' like this year after year. Blowin' the land away. Blowin' the crops away. And blowin' us away now. Muley: Some say that I am. Agent: The fact of the matter, Muley, after what them dusters done to the land, the tenant system don't work no more. You don't even break even, much less show a profit. Why, one man and a tractor can handle twelve or fourteen of these places. You just pay him a wage and take all the crop. Muley: Yeah, but uh, we couldn't do on any less than what our share is now. Why, the children ain't gettin' enough to eat as it is, and they're so ragged. We'd be ashamed if everybody else's children wasn't the same way. Agent: I can't help that. All I know is, I got my orders. They told me to tell you to get off, and that's what I'm tellin' ya. Agent: Now don't go to blamin' me! It ain't my fault. Muley's son (Hollis Jewell): Who's fault is it? Agent: It ain't nobody. It's a company. Muley's son: They got a President, ain't they? They got somebody who knows what a shotgun's for, ain't they? Agent: Oh son, it ain't his fault, because the bank tells him what to do. Muley's son: All right, where's the bank? Agent: Tulsa. What's the use of pickin' on him? He ain't nothin' but the manager. And he's half-crazy hisself tryin' to keep up with his orders from the East. Agent: Brother, I don't know. If I did, I'd tell ya. I just don't know who's to blame. Muley: I'm right here to tell you, mister, there ain't nobody gonna push me off my land! My grandpaw took up this land seventy years ago. My paw was born here. We was all born on it. An' some of us was killed on it. (Muley squats down and fingers the dust of the farm he has just lost.) An' some of us died on it. That's what makes it arn. Bein' born on it and workin' on it and dyin', dyin' on it. An' not no piece of paper with writin' on it. They come. They come and pushed me off. They come with the cats...the cats, the caterpillar tractors. (A series of dissolving montages illustrate how the land company's tractors and farm equipment invade the farmland.) And for every one of 'em, there was ten, fifteen families thrown right out of their homes. A hundred folks and no place to live but on the road....One right after the other, they got throw'd out. Half the folks you and me know throw'd right out into the road. The one that got me come oh, about a month ago. In a second flashback scene, Muley - with his shotgun - futily confronts a house-demolishing caterpillar driven by another sharecropper's son. The tractor driver is a traitorous sell-out to the rich - he works for "three dollars a day," and rationalizes contemptuously: "I got two little kids at home, my wife, my wife's mother. Them folks gotta eat. First and only, I think about my own folks. What happens to other people is their own look-out." The driver warns Muley that if he is shot, another guy would show up in two days to take his place. The bulldozer moves in and knocks down the dilapidated shack in its path. The cat's tire tracks in the dust cut across the shadows cast by the family. What was the use? He was right, and there wasn't a thing in the world I could do about it....There wasn't nothin' to eat, but I couldn't leave. Somethin' just wouldn't let me. So now I just wander around and sleep wherever I am. I used to tell myself that I was lookin' out for things, so that when the folks come back everything'd be all right. But I know'd it wasn't true. There ain't nothin' to look out fer. There ain't nobody ever comin' back. They're gone! And me, I'm just an old graveyard ghost. That's all in the world I am. Muley: Come on, come on, we gotta hide out. Tom: Hide out for what? We ain't doin' nothin'. Muley: Well, you're trespassin', Tom. This ain't your land no more. And that's a superintendent with a gun. Come on! Tom is exasperated by the plight he finds himself in, after the patrol car drives off: "Anybody ever tol' me I'd be hidin' out on my own place...!" Tents and Cabins Furnished Free. Busy From October to February. Grampa (Charley Grapewin) bubbles over, excitedly exclaiming to Granma (Zeffie Tilbury) about how easy it will be to pick oranges and grapes in California: "Wait til I get to Californey. I'm gonna reach up and pick me an orange whenever I want it. With some grapes. Now there's somethin' I ain't never had enough of." I was so scared we was goin' away without ya and we'd never see each other again...Did they hurt ya, son? Did they hurt ya and make ya mean mad?...Sometimes they do somethin' to ya. They hurt ya and ya get mad and then ya get mean. Then they hurt ya again and ya get meaner and meaner til you ain't no boy nor man anymore, just a walkin' chunk of mean mad. Did they hurt ya that way son?...Why, I don't want no mean son.